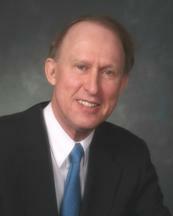 Larry Lemmen has been practicing law in his hometown of Coopersville, Michigan since 1973. During this time, he has been the attorney for three generations of area families, helping them with their estate planning, real estate, and business law needs. He has created Wills and Trusts and performed real estate transactions for hundreds of satisfied clients. Larry holds a certificate of completion for Probate and Estate Planning issued by the Institute of Continuing Legal Education. As a husband, father and a grandfather, Larry knows first hand the importance of a well-crafted estate plan. His clients benefit from the same expertise his family enjoys. Larry currently serves as a trustee for the Coopersville Area Community Foundation and an elder for the Coopersville Christain Reformed Church. He is a past Clerk and Treasurer for the church and also served on the Boards of Education for Hudsonville Unity Christain High School and Allendale Christain School. For recreation, Larry enjoys woodworking with an emphasis on audio speaker construction, as well as landscaping and garden design.